Crazy Diamond Design (CDD) fonts are desinged to allow the authentic recreation of historical documents. Where possible, they are faithfully reproduced from single historical sources. For each font, a complete standard character set is provided, including all punctuation, foreign and accented characters. Many fonts also contain extensive historical characters and glyph variants which reflect the written hand. All CDD fonts are unicode based and are available in OpenType (OT) and (in most cases) the Apple-specific AAT formats.When working on a PC, only the OT font should be installed. 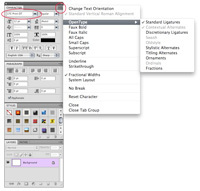 ; both AAT and OT fonts should be installed when using a Mac. All our OT and AAT fonts are in Unicode format.Whilst some applications don't currently support OT/AAT advanced typographic features, almost all can use Unicode and access the full range of historical characters. 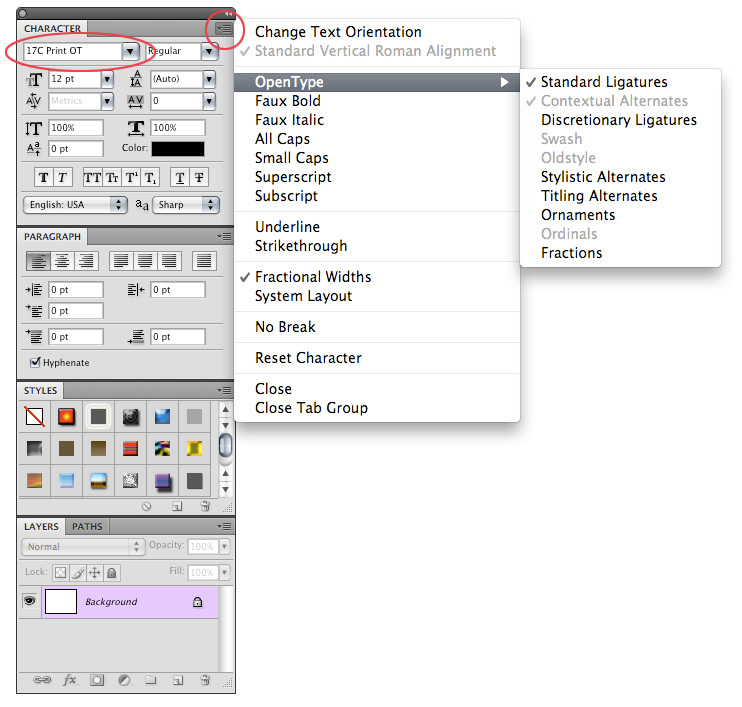 Some applications contain a character or glyph palette, which will display and provide access to all glyphs in the font. Examples include Microsoft Word’s Insert Symbol command from the Insert menu (ensure that the correct font name is shown in the drop-down menu, and scroll down to find the full set of glyphs) - click on illustration to the right. Some OpenType-enabled applications (see below) provide fully functional glyph palettes. Macintosh OSX and System 8.5 and above will recognise Unicode fonts and can access all historical characters (glyphs). There are two ways to obtain access to the full range of historical characters (glyphs) with System 8.5+ and OS X. Before using either method for the first time, go to System Preferences, choose International, click Input Menu, and ensure that both 'Character Palette (Unicode)' and 'Unicode Hex Input' have a tick next to them (OSX); in System 8.5+ the same option can be found in Control Panel under Keyboard. Some applications contain a character or glyph palette, which will display and provide access to all glyphs in the font. In OSX choosing Special Characters from the Keyboard menu (the flag in the menu bar) will reveal the Character Palette (open it when you are working with an OpenType font, and choose 'Glyphs' from the View pop-down menu; scroll through the glyph display below to find the historical glyphs). Some OpenType-enabled applications (see below) provide a fully functional glyph palette. The 'Unicode Hex Input' method can be used in many applications. Before entering any characters, 'Unicode Hex Input' must be selected in the Keyboard menu (designated by the flag icon).Then hold down the Option key, and type the four-hex-digit Unicode code point as found on the font's reference sheet (see image above). OpenType (OT) is a cross-platform font file format developed jointly by Adobe and Microsoft. It brings a number of general benefits to the use of all fonts on both Windows and Macintosh computers, but also offers particular advanced facilities which Crazy Diamond Design fonts make special use of. Adobe state: "The two main benefits of the OpenType format are its cross-platform compatibility (the same font file works on Macintosh and Windows computers), and its ability to support widely expanded character sets and layout features, which provide richer linguistic support and advanced typographic control." Apple Advanced Typography (AAT) allows us to embed sophisticated ‘substitutions’ and rules within our AAT fonts, which automatically substitute appropriate character combinations with historical ligatures, abbreviations or alternative characters. embed particular 'substitutions' and rules within our fonts, which (when used with suitable enabled applications) will automatically substitute appropriate character combinations with historical ligatures, abbreviations or alternative characters. select the Format menu, then Font and Show Fonts (Cmd-T). the Typography palette is then displayed (example shown below for 17C Print); see the separate individual font references for descriptions of items in this palette. indicates that the font contains three features: dlig substitutes historical ligatures; hist substitutes s with long s; and smcp provides a small capitals glyph set. Note that OpenType applications are currently patchy in their support of these features; some will provide access to the full set, but others might only provide access to the standard and historical ligatures (liga, hlig). The names of features also vary by application, and so some trial and error is required until standards emerge across the applications. These include current and recent versions of: Adobe Creative Suite (Photoshop, InDesign, Illustrator), Quark XPress, Mellel (Mac wordprocessor). OpenType is a registered trademark of Adobe and Microsoft, and is used here for information purposes only.